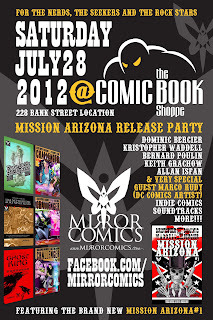 "A lot of ideas over a long period of time that culminated once this needed to be done" is how Kristopher Waddell explains away the fact that the production company bringing Ottawa borne horror comic Mission Arizona to light is just a year old. 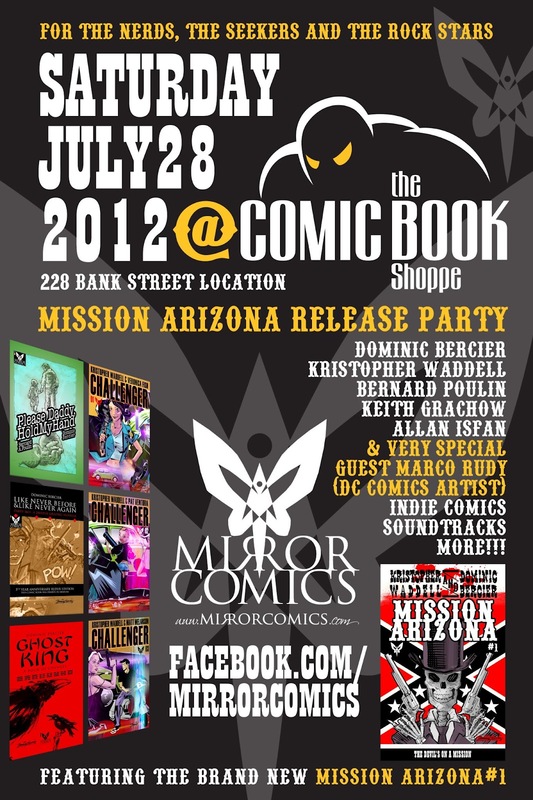 Dominic Bercier (illustrator/president/publisher), Wadell (writer/editor-in-chief) and Allan Isfan (vice-president) are the core behind Mirror Comics who will be at The Comic Book Shoppe on Bank Street Saturday July 28 to launch this three issue series. I have been buzzing about this since meeting the illustrator and writer at Ottawa ComicCon and am super excited to have had the chance to sit and chat with them earlier this week. And you can too! Next Saturday, Bercier, Waddell and Isfan will be available along with Please Daddy, Hold My Hand author Bernard Poulin, DC Comics Swamp Thing artist Marco Rudy, and Sunset Coast's Keith Grachow. Turning through my signed edition of Mission Arizona, I can honestly say I am gripped. The story, art and presentation is more than expected from a team that has only been in production for a year. Waddell explained that a lot of independent companies that approach comic distributors and shops are all talk. "It's hard to find a publishing company so you just do it on your own. I could not do it on my own, I don't think Dominic could do it on his own. We each bring a piece of pie to the table." Bercier adds "No way I could have done all of this without Kris. No way. He joined us just after we launched, and has helped grow the business immensely." The way these two work together, there is certainly mutual pats on the back to be had. And thus, things get done. Do they ever. I can't help but mention it again, but as you look over the projects coming in the next year from Mirror, keep in mind they have been in production for One Year. Impressive. "The reaction is shocking," said Bercier. "People want this book, and some least expected to want this book say they don't just want it, they need it," and they describe it as the best thing he has ever done. The cover grabs the attention of future fans, shop owners and fellow artists alike. Within the Mission Arizona story, there is a sense of Dark Tower otherworldlyness, A dash of Bradbury's Something Wicked...and perhaps a little Carnivale or Dracula. All in all, it is a tale that stands on it's own and by the end of the first issue, I certainly want more. To have Waddell and Bercier explain the plot and future issues, I can barely picture how they will distill the imagery of the vast story described. The characters of the three wives, let alone Boone and the boy Samuel... well... I am the last person to give spoilers so I will leave well enough alone. Come to the Comic Book Shoppe and snag a copy next week. The American Southwest is brought to life and the setting created so simply, it hints that there are intimate connections with Arizona outside of the confines of the Canadian capital. Waddell spent two months in Arizona, filming a documentary a decade ago, and wanted to set a story there. It was years before he pitched the idea to Bercier who explained, "he wrote it, I drew it, then we reacted to it," where they would swap out portions of story line, illustrations, entire pages if need be - to tell the story right. Bercier also has also "been to a bunch of places in Arizona, it's fantastic." having had family there at one time. "There is that weird confidence knowing what is should look like, and what it can't look like. It plays a big factor when I'm drawing. I do use photo reference but I have a sense of what it should be and what the story needs and it's a balance." To get some of the international and even more amazing Mirror news, take a listen to their most recent interview. The duo was in studio with Alan Neal on CBC Radio's All in a Day. Check the link to hear about their involvement with Music in Boxes (Rodrigo Moreira Pinto and Davi Mello, of Sao Paulo, Brazil) who have adapted Evanescence's hit Bring Me To Life to the story of Orpheus travelling the underworld. This will be published by Mirror Comics in 2013. I just simply do not have the room in this article to cover what is discussed thoroughly in the radio broadcast, so do tune in. "Music and comics have long been the credo at Mirror Comics, even if we’ve just been around for just over a year." Dominic said. For the western-horror Mission Arizona, they use Ottawa's blues-folk legend John Carroll’s The Devil Comes Quick. The trailer, though short, gives a great view of the work coming up in this series. Waddell’s Challenger mini-series, will get a musicians treatment too, using the C696 song Ride when reconfigured as a graphic novel in the fall. Challenger is an action series that at one point features "a run-down neighborhood charmingly called Mechanicsville," a nod to the Ottawa area. Never Before & Like Never Again was originally penned by Bercier for 24 Hour Comics Day, a worldwide event akin to the 3 Day Novel challenge. It will receive a musical accompaniment as well with AuCanada by Darren Grandbois. The French-Canadian song goes well with the Bewitched Canoe story, or Gallery's Hunt, which you may recall as featured on the Unibroue beer label for popular brand, Maudite. Blanche de Chambly is one of my favorite brews from them, though no where near horrific looking as 'The Damned', Maudite. This is perhaps not the most horrific thing, but there are threads of the macabre, the underworld and the eerie in a lot of work from both men. Nicholas Bercier, Dominic's brother, produced a full soundtrack for his Ghost King: A Book of Changes. The snippet can be seen and heard below, bringing home this comic presentation. This treatment can get tiresome for a feature length film, we know, but for the intended length of a comic issue, it proves perfect naturally. Having heard the entire album, I look forward to it's wider release. 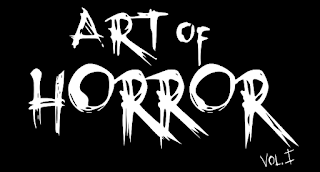 Music aside, fear fans will certainly scramble for the next foray into horror from Mirror. Kris painted a picture of the over-arching plot in Big Box Apocalypse which will debut in December as Mission Arizona wraps up. This is where local alternative model Naomi VonKreeps comes in. There will be a sneak-peak of her at Saturday's event at the Comic Book Shoppe. Word is that she closely resembles a character in the new series and has agreed that her likeness be used in promotion. As Dominic stated perfectly, "we like tying our projects to talented and interesting people." And being two madly talented and deeply interesting people, I guess this is the star-studded line-up we get for their debut year. I am keeping both eyes on Mirror Comics for good.